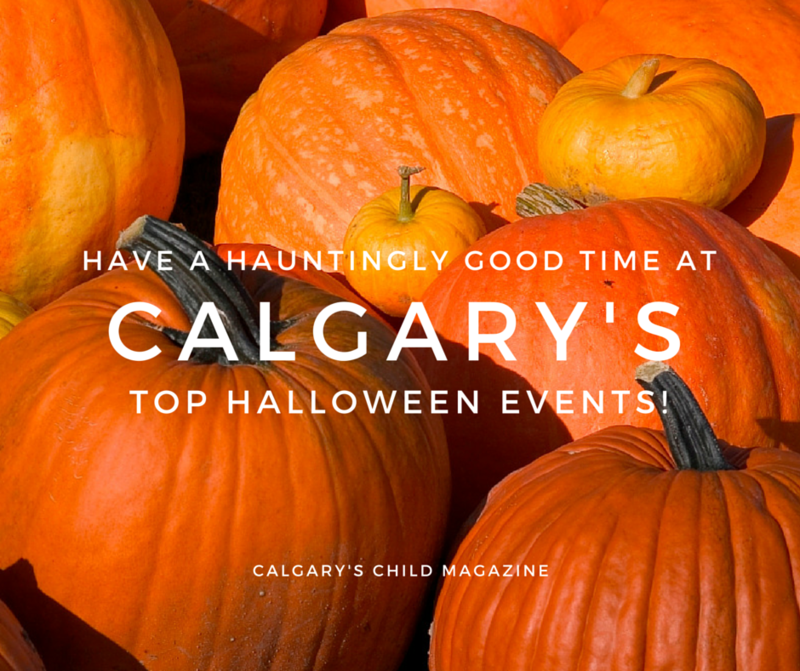 Halloween Haunts and Autumn Fun in Calgary! October is one of our very favorite months of the year – it’s packed full of autumn and Halloween fun! Bundle up and enjoy some of these great family activities in the foothills region. Our 2018 Thrill Calgary event will take place on Saturday October 6th. The event starts at 2:30pm in Olympic Plaza in downtown Calgary. After the dance, we’ll join hundreds of other zombies to walk the streets of YYC in Calgary’s Annual Zombie Walk event. Memorize as much of the dance as you can, using our YouTube lessons. You don’t need to know it perfectly or completely to join in. Although it’s not required, almost all of our participants dress up for the event. Copy a zombie look from the iconic Thriller video or create your own. Remember, it’s free to participate in the Zombie Walk after the flash mob. Check the website for more information. Off you will go on the tractor-pulled hay wagon, rolling through the crunchy Fall leaves just hoping to find some kid-sized pumpkins! Once you find the pumpkins, you’ll bring them back and decorate them into creative pumpkin-head masterpieces! While the glue dries, enjoy a visit with your favorite animal friends in the farmyard! Your visit includes hunting time, pumpkin-decorating (no carving), and a farmyard visit with the animals! Each child takes home their very own pumpkin masterpiece. Ready to order your tickets? Visit the website to purchase tickets and for more information! Fridays & Saturdays in October. Lights Out at Cobb’s Adventure Park. Make your way through the corn maze in the dark – with nothing but your flashlight! Enjoy the bonfire and creep tractor ride, too! Suitable for all ages, Field of Screams features 4 nightmare-inducing haunted houses and the new Cornfield of Terror: a cemetery maze in a cornfield. There are also rides, activities, and more! Walk through the pumpkin patch, take beautiful photos, and pick your favorite pumpkins to buy for Halloween carving! Events for the whole family you won’t want to miss. For more information, visit the website. From October 6 to 31, take risks and be curious ! Enjoy frightfully-fun activities as you explore the spooky science behind Halloween. You might be shocked by what you learn! Plus, Monster Mash-Up (sponsored in part by Calgary’s Child Magazine) is back on October 27 & 28 for the final weekend of SHOCKTOBER. Potion Pour: Brew up a colorful potion, pour it out, and watch it slide down a Halloween sculpture in a fascinating pattern! Giant Spider Scare: Spiders have invaded and are guarding the secret mad science lab! Weed your way through giant spider webs. Destroying a pumpkin with science: Watch the spectacle as a science professional crushes, slices, smashes, obliterates, flattens, or otherwise destroys a pumpkin! Host Parasite Interaction Group: Don’t be afraid, be curious and discover the unknown world of parasites. Spooky Science Demo: A mad scientist will cook up a live science demonstration. Enter into the world of his secret laboratory and experience wild and shockingly spooky science! Thriller Dance: Get your ghostly groove on and learn Michael Jackson’s Thriller dance with Calgary’s Decidedly Jazz Danceworks. SHOCKTOBER is included with General Admission. For more details, visit the website. October 25 to 28, 2018. Meet the Addams Family at the Famous 5 Centre of Canadian Women, Enjoy a Villainous Vaudeville Show, Learn to play Quidditch from the pros with the Calgary Quidditch Club and more! Ghouls’ Night Out at Heritage Park is perfect for families with little ghouls, aged three to nine, who are looking for a fun, safe night out. As this event sells out regularly, we strongly recommend purchasing tickets in advance online to avoid disappointment. Halloween Toddle Down to the Okotoks Art Gallery! Friday, October 26, 2018 – 10:00am to 12:00pm. It’s hard to make time for art and culture when you’re chasing after a toddler but we have an opportunity that doesn’t require you to choose! Come down to the Okotoks Art Gallery for a morning of fun. Enjoy exhibitions as you let your toddler explore up to 12 different hands-on activity stations and art activities. This event will be Halloween-themed and costumes are welcome! Recommended ages 1 – 5. This year all fantasy fans are welcome to swarm Downtown Okotoks as we celebrate medieval culture, witches, wizards, dragons, role-playing, cosplay and more! Stores will be transforming with activities and awesome unique items for sale, shows will take place on the Towne Plaza, artisans will be selling in the magical market at the Elks Hall, the Okotoks Arts Council will be creating a fairy garden for those small kiddies and bigger “kids” can take part in our LIVE ROLEPLAYING GAME. Enjoy our mythical petting zoo, a medieval camp in Ethel Tucker park, and much more. Website. Oct 31, 2018 at 1:00 pm – 3:30 pm. Fun for the whole family! Come in costume and enjoy this family-friendly event. There will be various activities around the facility for you to enjoy! Cost is $15 per family and is free for members. Website. Oct 31, 2018 at 4:30 pm – 6:30 pm. Come dressed in your favorite costume and join for creepy crafts, ghostly games, and fun, ghoulish activities! Website. Throughout October. Check your neighborhood community association’s website – many neighborhoods hold some kind of fun Halloween dance or event for the little ones! Takes Place Fridays & Saturdays, October 5 & 6, 12 & 13, 19 & 20, 26 & 27, 10am to 9pm (but must arrive any time before 8pm). Calgary Corn Maze & Fun Farm Flashlight Nights. Flashlight nights are an extremely popular activity as guests love getting lost in the dark. Free for kids 2 and under. For more information, visit the website. October 6, 7 & 8, 13 & 14, 20 & 21, 27 & 28, 10am to 5pm. Calgary Corn Maze & Fun Farm Autumn Pumpkin Festival. This award-winning festival is a must-do for your Fall activity list and has become an annual tradition for families! There will be hundreds of pumpkins, locally-grown and ready to pick for your perfect jack-o’-lantern. Join for the great Pumpkin Explosion, pumpkin patch crafts, wagon rides, pig races, large and small corn mazes, zip lines, ropes courses, petting zoo, and more! Free for kids 2 and under. For more information, visit the website. September 29 & 30 (Kids & Critters), October 6 & 7 (First Responders and Veterans), October 13 & 14 (Country Carnival), 9am to 5pm. Autumn Jubilee at Kayben Farms! Each day of the festival, enjoy food from JoJo’s Café, pumpkin carving and painting, horse-drawn wagon rides, family activities and games, plus the full Sunshine Adventure Park experience (corn maze included) – adding up to a whole lot of Fall fun! For more information and to purchase tickets, visit the website. October 17, 10am – 2pm. Please join at the Harvest Market downtown on the main floor of Gulf Canada Square (401, 9 Ave SW.) There will be local producers, food, art, fashion, and health & wellness. It is perfect for all your Market needs! Free admission. Website. This entry was posted in Uncategorized on October 1, 2018 by Calgary's Child.